Revolution: Take Your Knickers Off! album cover. "Revolution" is a song by The Beatles that was originally released on The Beatles (the White album) in 1967. "Revolution 1" is a slower version of another song, "Revolution", which was released as a single. Both of these feature similar lyrics. Another song that followed in this tradition was the mystifying "Revolution 9". While this one is also off of the White album, it's completely different from the other two as it combines many discordant sound loops and lasts about nine minutes. 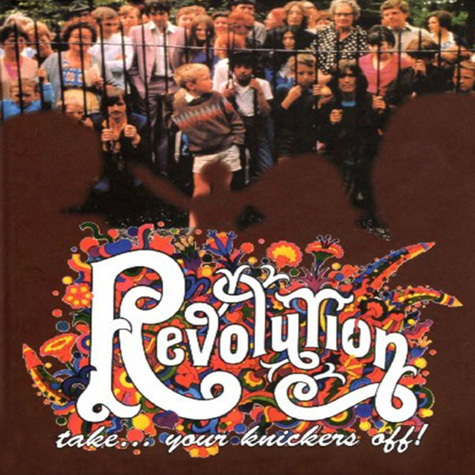 After these versions of "Revolution", another version was rumored to exist on a bootleg Beatles CD called Revolution: Take Your Knickers Off! which has since been uploaded to YouTube. This version was referred to as "Revolution 1 (Take 20)" because early in the track we can hear one of the Beatles say "Take 20!" before the music begins. This unusual version of the track is 10 minutes and 46 seconds long, starting with a slower version of "Revolution 1" before beginning a pattern of sound looping much like that of "Revolution 9". "Take 20" is now understood as an effort to release "Revolution 1" and "Revolution 9" as the same track. Some of the sound clips used in this version seem to be earlier versions of those used in "Revolution 9". Upon the leak of this version onto YouTube in 2009, EMI did everything in its power to suppress it, including demanding YouTube take it down and stopping websites that offered download links to the song. However, due to its popularity and the number of users who downloaded it, the song survived and is available to listen to below. For the 50th anniversary of The Beatles, a 6-CD box-set was released containing 50 studio outtakes from the album's sessions. However, "Revolution 1 (Take 20)" was not released. Instead, an early version (label "take 19") which didn't not contain Lennon and McCartney's "Mumma, Dadda" chants or the some of the effects and tape loops on "Take 20". Meaning "Take 20" is still officially unreleased.